Pennsylvania’s Keystone Fuzion Toy Hauler Dealer, Lerch RV. It’s More than a Garage! With automotive exterior lines and innovative interior patio door the new Fuzion is “More Than A Garage”. Boasting a stylish modern interior with custom furniture and cabinetry the Fuzion has a look that is unparalleled. One look at the Fuzion is enough to get your heart racing! Manufactured by the Keystone RV Company, the Fuzion line up of fifth wheel and travel trailer toy hauler RVs is pretty amazing. Currently Fuzion offers four different travel trailer toy hauler floor-plans that range from 30′ – 35′ in total length. With unladen weights ranging from 6,700 lbs through 9,150 lbs., there is a Fuzion travel trailer toy hauler for everyone. Fuzion fifth wheel toy haulers are produced in eight different floor-plans. Ranging from the Fuzion 310 at 35′ in length up to the Fuzion 412 at a total length of 41′. The Fuzion toy hauler offers the avid RVer, a 102″ wide body, 3/8″ roof decking, 5/8″ one piece decking in living area, a full 1″ one-piece decking in garage area, 5″ wood trussed roof spaced at 16″ on center which gives you a full walk-able roof. Aluminum framed, fully laminated fiberglass side walls sit on a frame of 10″ or 12″ steel twin I-beam construction. Solid surface counter-tops in the kitchen and bath are both beautiful and durable. The high-rise pull out kitchen faucet allows you to easily fill larger vessels in the sink, instead of elsewhere. The Fuzion fifth wheel offers more and larger windows than any other RV in its class. And virtually all Fuzion windows open to bring in the fresh air. Leather wrapped window treatments add style, while recessed lighting from above adds to the elegance. And do not forget those day/night shades for privacy and functionality at all times of the day. The garage area of a Fuzion is really a true multipurpose room. It is just not a garage any longer, it is versatility. Whether you plan on using the garage as your ‘Man-Cave’ for the weekend, or a bunk house that offers the comfort of home. The screened in porch and opening windows provide you with un-limitless ways to enjoy your Fuzion garage. In conjunction with many great features, Fuzion offers two gray water tanks with 86 gallons of capacity, a black water tank with 43 gallons of capacity and 100 gallons of fresh water. For most models, 60 pounds of propane with automatic change over comes standard. A few upgrade options include a 5500 watt generator, double electric queen beds with opposing sofas, six point level system, 2nd AC with heat strip, dual pane windows, rear ramp patio with awning, and Fuzion’s intense full body paint. Keystone Fuzion toy hauler fifth wheel, in full body paint. Whether you are bringing the toys along, or are looking for more interior storage space. 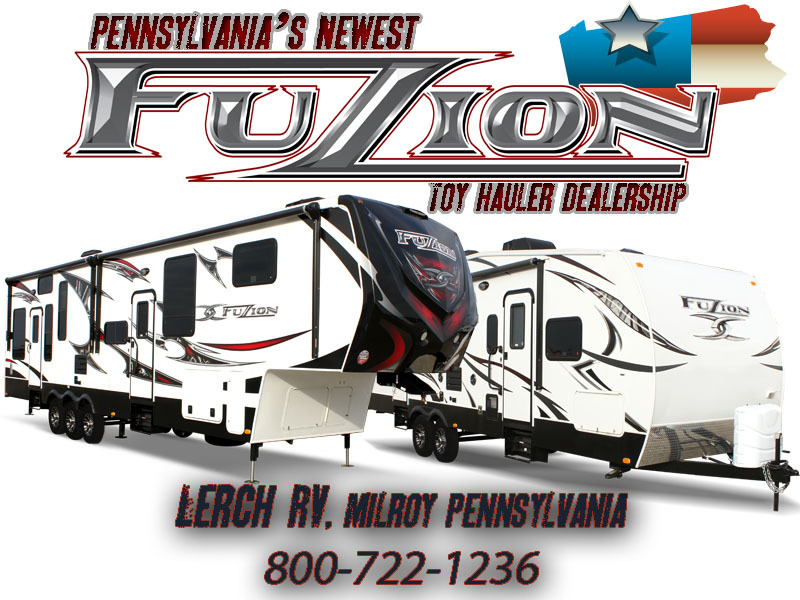 Stop by Pennsylvania’s newest Keystone Fuzion dealer, Lerch RV and take a look at the new 2013 Fuzion toy hauler fifth wheels and travel trailer offerings. This entry was posted in 5th Wheel Campers, 5th wheels, Campers, full time rving, RV, RV Dealer, RV Lifestyle, RV service, RV Towing, Travel, travel trailers and tagged fifth wheel, Fifth wheel coupling, Floor plan, Fuzion RV, Fuzion toy hauler, Keystone RV, Keystone RV Company, Lerch RV, new PA RVs, new RV, Pennsylvania, Pennsylvania camper dealer, Pennsylvania fifth wheel, Pennsylvania RV Sales, RecreationalVehicle, toy hauler Rvs, Toy Haulers, Travel trailer. Bookmark the permalink. ← Pennsylvania RVers, how do you keep your clothes clean?